IBM, a leader in collaboration, has created IBM Workplace Collaboration Services--a new completely, integrated collaborative environment based on open standards. IBM Workplace Collaboration Services provides a wide range of integrated, ready-to-use communication and collaboration capabilities as services for the IBM Workplace environment. This includes capabilities such e-mail, calendaring and scheduling, presence and awareness, instant messaging, learning, team spaces, Web conferencing, and document and Web content management. 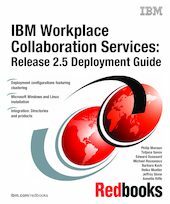 This IBM Redbooks publication is an installation and deployment guide for IBM Workplace Collaboration Services Release 2.5. We provide detailed installation procedures for Microsoft Windows and Novell SUSE Linux and highlight clustered deployment.